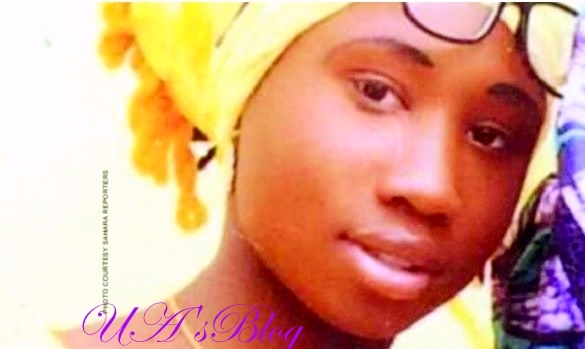 Leah Sharibu who has been in Boko Haram's den for months reportedly had a brief discussion with her mother in a dream. Mrs Rabecca Sharibu, mother of the only Dapchi schoolgirl under Boko haram captivity said she has reunited with her beloved daughter, Leah, four months after. The mother, said, her brave Leah appeared to her midnight in red dress and hugged her with a broad smile, "I finally got my freedom Mama," she said. Rabecca said the minutes of the excitement was cut short when she suddenly woke up to realise it was a dream. Fielding question on whether they had a memorable discussion, the anxious mother said "Yes, we hugged each other very tide in such a way that no force can separate us before narrating to me her ordeals. "Mama I really suffered in their hand. We use to sleep on leaves and barely take bath. but, they fed me well" she said. "That minutes of excitement nearly took away all my sorrow. Sadly, it was a dream. I cried when I opened my eyes and realized it was a dream. I tried going back to sleep for more discussion but I couldn't. I cried throughout that night and pray that God should make it a reality". On whether she would allow Leah to continue in the school, Rabecca said, "She rather stay out of school than returning to GGSTC Dapchi. I already transferred her brother to a school in Jos. She is the only one I am waiting for now". Staying alone in a mud house, Rebbeca is desperately waiting for her daughter, Leah, to return. Rabbeca, a mother of two, a boy and the only girl in captivity who refused to denounce her religion, decried that no official from the federal, state governments or even the school principal knocked on her door to sympathize with her. She said that government had kept promising to Nigerians that her daughter would be safely rescued without keeping the family abreast. "It's very sad and frustrating each time we hear something from the Media about our daughter. Recently, government said that negotiation for my daughter's release is complicated. As parents, we should be informed of any development before going to press. The government's attitude of relaying the information is making me angrier and more frightened by the day. Each time a story like this come up." she said. "It's by the help of media that the government is intensifying effort for her rescue. If not, we would not know what will happen," she revealed. She decried that the only way they reachout to government is through interviews with the media, "There is no other way to speak to them, we aired our grievances in the media, and the government always respond to the stories to provide defense. Only 'Aisha' one of her released abducted friend visited me." The mother said that, since the release of the abducted schoolgirls, only one of them 'Aisha' had visited. "She told me that many of them wanted to come but they don't want see me crying. Her best friend Liana usually call me on phone to ask about Leah but has not came to visit me", she lamented. It's recalled that on February 19, 2018 Boko haram militants have stormed Government Girls Technical College in Dapchi, Yobe State where they abducted 111 schoolgirls. All but six of the Dapchi girls were returned to the school on March 21, 2018. Five were reported died in captivity while the only Christian girl Leah is still being held. Government Girls Science and Technical College Dapchi has re-opened on April 30 but of most pupils have refused to return out of fear. A source in the school told a DailyTrust reporter that over 300 students have returned out the total number of 989. He over 200 students are writing their final year examination, while the rest would continue with the study. The commissioner, Yobe State Ministry of education, Mohammed Lamin, said they have done everything possible to make the school safe for the student to continue their education. He said that security operatives were deployed to provide 24 hour security in the school. "We advised parents to have confidence in us and the system we have put in place," he said.